I saw a blog post recently that listed 65 "VC blogs". It included this blog. And I am sure that many people think of this blog as a VC blog. But it is not a VC blog. It is a Fred Wilson blog. Sure I write about VC, because that’s what I do for a living (and for fun too). But it’s also about other stuff that I find interesting. Don’t get me wrong. I am sure that the vast majority of my readers are entrepreneurs or others who are interested in the VC point of view. And I think that advertisers who want to reach that audience should find this blog to be an attractive place to advertise. mainstream sources and adding depth and color to the conversation. Personal publishing is by definition personal. It’s by people. Meaning it isn’t edited, scripted, couched, qualified, or programmed. I am sure there are many blogs that are edited, scripted, couched, qualified, and programmed. But I don’t read them. I want "depth and color added to the conversation." I like reading what other people write in the comfort of their own pages. If they are writing about VC, great. If they are writing about music, great. If they are writing that their best friend died, that’s fine too. As long as it’s personal, real, and authentic. If I want the other kind of writing, I can turn to the New York TImes or the Wall Street Journal. I have been addicted to the Hype Machine lately. Yesterday The Gotham Gal decided she wanted to start putting a cover song on each Positively 10th Street podcast. So we went to the Hype Machine, typed the word cover into the search field and got a list of amazing covers that had been posted on blogs in the past week. She picked the David Gray cover of the Killer’s Smile Like You Mean It, but my favorite is Ray Lamontagne’s cover of Gnarls Barkley’s Crazy. As much as I like the original, I like Ray’s version better. Acoustic guitar with soulful singing. Excellent! We did a podcast today on my new MacBook Pro. As a result we went with new audio software – GarageBand instead of Adobe Audition. It was a frustrating experience as I was not able to get the recorded audio to work right and you’ll hear that the sound quality on the talk portion of this podcast isn’t great and is certainly not up to our standards. I think I need a tutorial on GarageBand. Maybe I’ll attend one of those sessions at the Apple Store in Soho. Anyway, it’s too bad because the music on this podcast is terrific and is all stuff we’ve just heard in the past couple weeks. What a weekend. Pedro came back strong after a month off. And yesterday my main man El Duque showed why he has to be in the postseason rotation. As I write this, the Mets are finishing off a sweep of the Braves in a hitfest of a game. Carlos Beltran went crazy this weekend. If he keeps this up, he’s the MVP for sure. I got some bad script the other day and it took me down for almost 36 hours. But it was an interesting experience that opened my eyes to the the risks of taking code from various places and running it in the same place (my blog). But there is a downside to this massive experimentation with script of various kinds. It’s certainly to do with all of the "bling". First, I did an HTTP trace on your main page. It requires well over 300 HTTP requests to load the whole thing. That, in itself, does not "cause" slowness, but it’s just the first point I wanted to make. But the fact is that those 300 HTTP request took over 1 minute to complete on a 45 Mbps connection. That’s pretty slow for a single web page to load. The second point is that most of those HTTP calls are distributed over numerous service providers and, by extension, "hosts". This means that each hostname must be looked up by the DNS client on the requesting computer (the user’s PC). DNS can be flaky and has been for a few sites recently. But even when operating optimally, each request takes a little bit of time. So each little bling item you add requires numerous extra queries by the client computer. When even one of these name lookups fails or has a delay, it generally causes the whole page to load only partially or, in some extreme cases, not at all. Each additional widget or bling introduces more chance of this happening — just like adding more disks to a system means one is more likely to have a failed disk. By my count, my computer had to look up 37 different hosts just to load the first page. Once they have all been successfully looked up, the DNS client (and local DNS server — long story) on the user’s computer (or network) generally caches the results and subsequent requests can go to the web servers without having to do the lookup first. That explains why you don’t see any noticable issues — you’ve already looked up all the hosts. I’ve noticed some inefficiencies in the way publishers, ad services, partners and the like have set up their services, but there very well may be good infrastructure or service reasons they have done it, so I’ll reserve comment on that and just assume they know what they are doing. So while the web has made it easy for consumers to mashup web services directly on their own pages, there is a looming problem with the architecture of all of this. One bad piece of code can take down the whole shebang, like what happened to me last week. And what if some bad code on the page impacts someone else’s code? My page stopped loading at the part of the left sidebar where the coComment widget started. And so many people guessed that it was coComment that was causing the problem. And taking down the coComment widget fixed the problem, but they could have just gotten hit with a conflict from some other script on the page. As my friend Brad Feld pointed out in an email, nearly all of my portfolio companies got blamed at some point in the debugging process! The bottom line is I have a ton of other people’s script running on my page generating something like 153 errors on the page. That’s a bad script trip for sure. But I am not going to stop experimenting. It’s too much fun. The Dead 2.0 blog has an excellent post on the current state of the venture funding environment for consumer facing web services. where we started. There’s a lot of folks out there with nifty ideas. a lot of money that they must invest sooner or later. There’s a lot of momentum, hype, and energy going into an area that the decision-makers generically as a whole do not seem to fully understand. And how could they? It’s too much, too fast. My only beef is he took my line about mashing up RSS feeds which was about the opportunity to create more transparency on Wall Street and applied it to consumer facing web services. Oh well, everyone is entitled to take a quote out of context if it helps make a point. Anway, it’s a good post with lot’s of references/links in it. Give it a read. Bluetooth….sounds like something you get from eating Blackberries. Jackson says he didn’t make this up, he heard it from a comedian named Jim Deken. Thanks everyone for the incredibly helpful emails and comments. 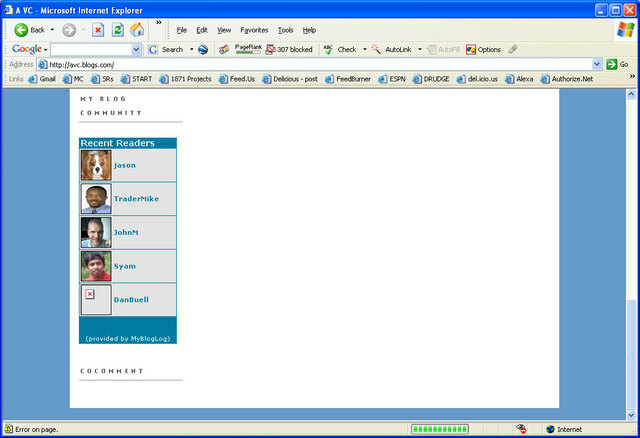 I’ve removed the coComment widget from the blog and the page loads now in IE. But I doubt it was coComment that caused the problem, I think they were just the victim. The whole experience was really eye opening to me on a number of levels and has inspired a post that is begining to gel in my brain. Watching Golden Smog cover Starman the other night has gotten me into a Bowie mood. And when I get to my house later today, I am going to put my vinyl copy of Hunky Dory on the turntable and turn it up. I love Hunky Dory, almost as much as Ziggy Stardust, which is on my top 50. 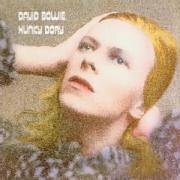 Hunky Dory came out right before Ziggy, during the early 70s, when Bowie was at his artistic peak. Hunk Dory is not nearly as much of a rock record, to me it’s a pop/folk record. It starts out with Changes which is probably the most played Bowie song ever. But it’s songs like Oh You Pretty Things, Life on Mars, and Andy Warhol that make this record so special. I can’t wait until I get home and give it a listen. 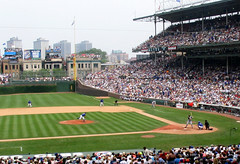 I stayed over after the FeedBurner board meeting yesterday and went to a game at Wrigley Field last night wtih my friend Al and a couple of his friends. I’d never been to Wrigley and it was long overdue. It’s a special place and the Cubs even won! Update – the photo on this posts was not from last night’s game versus the Cardinals. I forgot my camera last night unfortunately. This photo is one that I found on Flickr that I really liked. Our seats were similar, but a little lower and closer to third base.